Unique, supra-nano filled spherical composite that blends through a range of up to 10 shades. While working time, curing time, polishability, and overall esthetics are all important variables when selecting a universal composite, clinicians also put simple and flexible shade matching at the top of their must-have properties for this category of restorative material. Over the past decade, Estelite Sigma Quick from Tokuyama Dental America has become a reliable and trusted universal restorative resin composite because of its wide shade matching ability, superior wear resistance, and beautiful results. Estelite Sigma Quick is indicated for direct composite restorations, composite or porcelain repairs, diastema closure, and composite veneers. Estelite Sigma Quicks properties allow for easy shade matching and shade stability. Clinicians can do more with less because of the ability of one shade to integrate into a wide range of shades. Additionally, Estelite Sigma Quick does not shade-shift, ensuring predictable before-and-after curing. Estelite Sigma Quick's wide shade range matches for a seamless blend, eliminating the demarcation. In addition, it offers 3 opacities, allowing clinicians to customize shade selection for the variety of restorations they place every day. Tokuyama indicates that Estelite Sigma Quick's shade matching capabilities can save clinicians money through reduced inventory because they do not have to stock as many shades. Estelite Sigma Quick is known for its handling and polishing. The material resists slumping, so clinicians can easily create anatomy. Additionally, Estelite Sigma Quick offers excellent polishability and physical properties. It can polish quickly with minimal effort, and it creates long-term gloss retention. The material?s glossiness is 92%, providing excellent esthetics. Estelite Sigma Quick can work with any polishing kit, which gives clinicians flexibility when working on restorations. Due to the spherical filler's ability to resist plucking, Estelite Sigma Quick maintains long-term polish retention. Paired with Tokuyama's Bond Force adhesive, clinicians can use Estelite Sigma Quick in 3 easy steps. Simply fill and sculpt, light cure, then finish and polish. Beautiful esthetics are provided because of Estelite Sigma Quick's high-diffusion that allows blending with surrounding teeth, extreme resistance to slumping for simplified creation of anatomy, and high-gloss for initial and long-term polish retention. Estelite Sigma Quick restorations exhibit enduring stability without harming opposing dentition along with retained levels of surface smoothness and reduced abrasion for long-term wear resistance. Finally, a low volumetric shrinkage rate of 1.3% eliminates the risk of marginal leakage for lasting patient comfort. 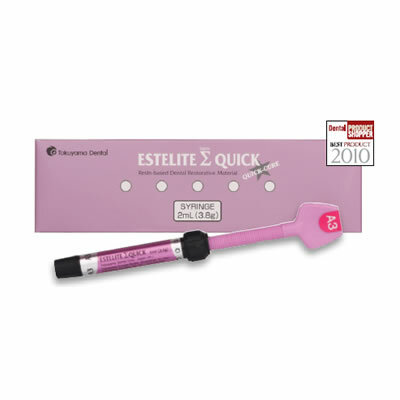 In a 2010 Dental Product Shopper evaluation, Estelite Sigma Quick was rated a Best Product. Evaluators gave it high ratings in esthetics, color stability after light curing, and polishability. Comments ranged from, "It is very easy to use and very manageable," to, "It stays where you put it and is easy to sculpt." You and Your Patients At the end of the day, what dentists are looking for in a universal composite is a material that is easy to use, reliable, and that provides the range of shades that give their patients a beautiful, esthetic restoration. Tokuyama's Estelite Sigma Quick is designed to meet those clinician needs. Estelite Sigma Quick has several products available, including Estelite Sigma Quick Syringe, Estelite Sigma Quick PLT (Pre-Loaded Tip), Estelite Sigma Quick PLT Mini Kit, and Estelite Sigma.